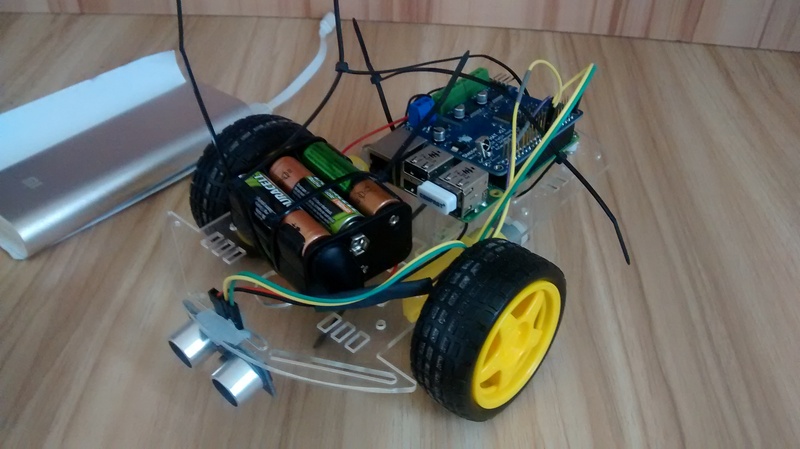 Recently I got the chance to give a bit of an introduction to python and physical computing on the Raspberry Pi to some kids so I thought a robot would be a fun thing to use as a demonstration. The aim was to get a working autonomous robot as simply as possible. Here’s the full write-up. Since I wanted to be able to use the robot outside, away from my router, I also configured the wifi to act as its own hotspot, as per my instructions here. The distance is continually check at the start of each loop, using the getdistance() function, which uses the HC-SR04 ultrasonic sensor. If the distance to any object in front is less than 30cm, the robot will turn right for 0.22 seconds (approx 90 degrees at the speed set in motor.py). Otherwise the robot will move forward for 0.1 seconds. This means the robot can explore anywhere (by going forward), but won’t crash into anything. The plan for the next iteration of the code is for the robot to “look” around to ensure it can see obstacles nearby and not just directly in front, and to find the longest straight run, and then go in that direction.